"The NADC crew is currently finishing up after a long, hard, second hot week. All day every one of these employees has done a wonderful, SAFE job, accepted my guidance willingly, and I really think in my 40 years I have seen the best crew in a very long time." “It has been a great pleasure working with NADC, thank you for your outstanding job accomplished safely and ahead [of] schedule. Congratulation to the entire NADC and Garfield team for this important achievement! Once again, our special thanks and appreciation to the integrated site management team for all your support and focus on safety during the execution of this very risky work. "North American Dismantling has completed several major precipitator retrofits with Casey Industrial and came to this project highly recommended. Again, you fulfilled our expectations to the fullest. NADC completed work at the Lena, Louisiana project with the highest regards to planning, execution and safety. With NADC's input, Casey was able to shave 6 days of an already aggressive project schedule without compromising safety. NADC's crews mobilized and executed its phase of work with the professionalism and expertise we expected. Thanks for all you efforts, looking forward to working with you team again." "...the demolition phase was the beginning of the Boiler MACT Environmental Compliance Project. The project scope included the remediation of hazardous materials, dismantling of two (2) recovery boilers and associated equipment within the boiler house, and demolition and disposal of the building structure. Included within the main scope of the project was the demolition of an electrostatic precipitator, chip hopper bin, the chip hopper building, and a neutralization tank. The successful completion of this project is a true testament of North American Dismantling's experience. Under the leadership of Greg Goscenski and Dan Brown the project was completed on time allowing the next phase of the BMACT Project to begin. Again, Glatfelter wants to congratulate you on a job well done." 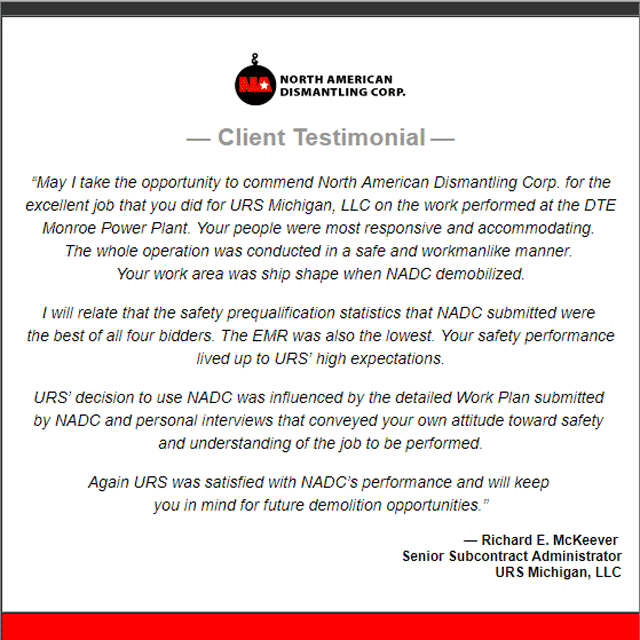 "May I take the opportunity to commend North American Dismantling Corp. for the excellent job that you did for URS Michigan, LLC on the work performed at the DTE Monroe Power Plant. Your people were most responsive and accommodating. The whole operation was conducted in a safe and workmanlike manner. Your work area was ship shape when NADC demobilized." “Thank you for the OUTSTANDING job of imploding the structure. "Tom – I would like to thank you and your TEAM for the help of the demo in Lena. You guys rocked this thing plumb out of the park, and helped Casey get the start needed to come in where we needed. Look forward to working with you guys again. Thanks again for all the help." "As the Senior MP&C Construction/ Site Manager at our JHCampbell Complex I felt it necessary to take a moment to compliment and thank North American Dismantling Corporation for the work your people performed at our JHCampbell site. The work performed was outstanding!! The surgical demolition of the unit #2 Precipitator without affecting plant operations at both units #1 & #2 was professionally done without incident. This speaks well of the North American Dismantling Leadership team. Mr. George Nelson your Safety Advisor was great to work with and responded to issues immediately. NADC had great command and control of the work area. Roll back and roping was maintained as well as dust control. With that being said You finished early. Bravo!!!!! NADC should be proud, Consumers Energy appreciates what you have done for us." “NADC established a Team which was able to work closely not only with the Owner’s Representative but also their various Sub-Contractors such that ALL WORK was completed without any additional costs within a very aggressive time line under difficult conditions." "The" demolition and environmental clearing of the General Motors Guide Site in Anderson, Indiana had a recorded 113,130 man-hours of work with no recordable accidents or lost time. Thanks again for the excellent safe and professional work well done. I am looking forward to having the opportunity to work with NADC in the future"
"Your company responded to the project with the utmost professionalism and expertise in completing all aspects of the project. The on site staff was courteous, professional and handled a multitude of challenges in a successful manner. Thank you for the excellent service that North American Dismantling Corporation provided to Xcel Energy"
"Congratulations on your CAM Safety Achievement Award. With the lowest submitted EMR it is clear that, over time, your company has put safety at the top of your priority list. Given the nature of your work this achievement is truly commendable"
"All too often we find ourselves discussing near misses and first aids and not the positive things that are seen on a project site. That’s what prompted me to send you this quick e-mail. While visiting the site this afternoon I attempted to access Phase 2 of the work area. As you are aware this is the area your crews are currently removing the floor steel. Your crew had a man assigned to watching the door in an effort to only allow your team in the work area. I questioned him a few times as to what was going on in the area and his response was that he was told to only allow NADC personnel through that door. That is exactly the type of response we’re looking for from your crews. This worker demonstrated the type of professional and safety minded attitude that needs to be recognized. Let him know we appreciate what he’s doing out there and to keep up the great attitude on safety!"